Giz Explains: What's So Smart About the iPhone 4S's Antenna? With the iPhone 4S, Apple says it will deliver an iPhone that works anywhere in the world, and with fantastic reception. How did they do it? One word: antennas. 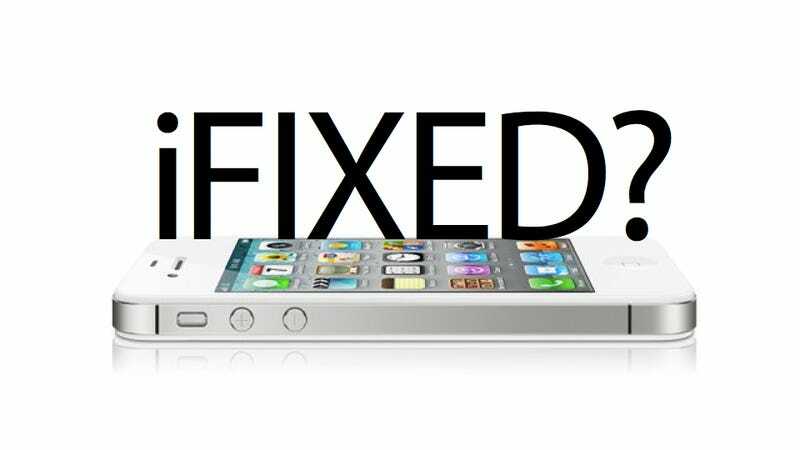 Apple's marketing guru Phil Schiller said the iPhone 4S "intelligently switches between two antennas to receive and send." Brilliant! But vague. How exactly does a smart antenna act? When you have a small, thin device that needs to receive and send multiple types of signals without interfering with one another, you need to get creative. As we learned from the iPhone 4 "antennagate," even the best engineers and designers can't always come up with a perfect antenna scheme. But antenna gurus have plenty of tricks up their sleeves, it's just a matter of finding the best recipe—and sometimes inventing a spanking new technology. "What [Apple] seemed to allude to was a switching or selective processing technique: taking the better signal between two antennas and using it," said Aaron Vronko, co-founder of Rapid Repair, in Portage, Michigan. That's one step in the right direction, but there are many other antenna hurdles to clear. On a cell phone, antennas have to be placed close together simply because cell phones are little. And antennas close together tend to interfere with each other. One way phone makers can address that is by placing antennas at opposite ends of the phone, a technique called spatial diversity. In the AT&T version of the iPhone 4, however, both cell antennas were at the bottom. So if you happened to grab the phone too close to both of them simultaneously, you would experience signal attenuation. Antennagate! But Verizon requires that the antennas on their phones be separated at the top and bottom of the device. That way, if you're holding the phone at the bottom, you likely have a free antenna at the top. Still, since a cell phone is so small, simply separating the antennas won't prevent all interference. You need a space between them of at least one full wavelength. At the lowest wavelength, about 900 MHz, that would be 13 inches. Not even Gordon Gekko's phone was quite that big (his DynaTAC was 9.8 inches). So engineers use other "antenna diversity" approaches, like polarity—placing the antennas at varying angles, or pattern diversity—using antennas with different radiation patterns. Going back to the improved Verizon iPhone 4 for a second, it did have better reception, but the service provider's antenna requirement only applied to received calls. Outgoing calls could go out on the same antenna. For the iPhone 4S, Apple probably implemented spatial diversity for both incoming and outgoing calls, according to Spencer Webb, CEO of AntennaSys, an antenna design and integration consulting firm. It's yet another improvement, but it's not enough to get a hardened antenna expert excited. "I do not think any special magic is going into this design whatsoever," Webb said. What Webb finds a bit more interesting is imagining how Apple and other cell phone makers pass the FCC requirements for radiofrequency emissions. All of this antenna switching uses a lot of energy, and all handheld devices have to stay below a specific (and quite conservative, according to Webb) level for transmitting heat to human flesh—and don't forget they have to cram the GPS and Wi-Fi antennas in there too. So to create a device that won't heat up your head (and to prevent excessive battery drain), Webb thinks Apple may have come up with a fancy algorithm for distributing antenna signals—which might be Apple's secret. Another bonus facilitated by the iPhone 4S antenna design is no more choosing between AT&T GSM phones for traveling abroad and Verizon CDMA versions for better reception but no service outside of the United States. Vronko guesses that Apple created a true world phone with an entirely new processor. And he can't wait to rip one apart on October 14 to try to find out for sure. "The biggest limitation in the past was the cost and availability of the baseband processor, which processes specific radio signals," Vronko said. "Its job is to send and receive radio transmission going to cell towers." But you needed a discrete chip for CDMA and GSM, and two chips in one phone would be bulky and expensive. Vronko says Apple probably called on a company like Broadcom or Marvell to build a new processor. "That has been done before, but it's not done that often," Vronko said. "There are not that many true world phones because they're expensive." If reception with the iPhone 4S works as great at Schiller claims, I might be convinced to upgrade from my iPhone 4 AT&T model. But who are we kidding? The iPhone 4S could require you to carry your own bunny ears around to make the thing work and people would still line up to drop their $500.